Devil’s Lake was originally a gorge of the Wisconsin River prior to the last glacial period which ended around 12,500 years ago. The river, which ran southward before the last ice age, was diverted to an easterly direction. A section of the glacier moved east of the Baraboo hills, came up the river valley, deposited the debris that it had accumulated and melted. This debris, or terminal moraine, blocked the river on the east. Another moraine settled on the northern end of the valley, thereby blocking both ends of the gorge. The river found a new course east of the Baraboo Hills where it resides today. Between the two blocked sections of the river, a large lake was formed. Today it is fed by a small creek and natural springs. The Ho-Chunk Nation has held celebrations at the lake for many generations. They named the lake "Da-wa-kah-char-gra" which means "Spirit Lake". Early settlers renamed it "Devil’s Lake". Located near Baraboo, Pewit’s Nest is a dramatic, rocky gorge through which flows Skillet Creek. In A Standard History of Sauk County, "William H. Canfield states that it received its name in 1843 from the fact that an ingenious mechanic built a workshop in a recess of the solid sandstone there, ten feet above a deep pool of water the basin of which had been excavated by the plunge of water over a fall of eight or ten feet in height. The approach to it was either through a trap door in the roof, or a trapdoor in the floor. If through the roof, it was by climbing down the rock wall to it; if through the floor, it was by a floating bridge upon the pool, with a ladder at its end leading to the trapdoor in the floor. The shop could not be seen from the mouth of the canyon, or from the top, or from any direction but one. Hence, by the early settlers it was called Pee-wee's Nest. Thence the eccentric tinker repaired in both senses of the word, mending watches, clocks, guns, farming utensils and everything else in a damaged condition which was not beyond repair. His lathes for turning iron and wood were operated by an old-fashioned centrifugal water-wheel. He also had a large coffee mill and a grindstone run by the same means. He was a good story-teller, a lively fiddler and not a bad preacher for the Mormon Church. In later years, and the last heard of the resident of Pewit's Nest, he had added the practice of medicine to his other accomplishments. After he abandoned the "nest," a sawmill was built near by, propelled by an overshot water-wheel thirty-four feet in diameter, with a shaft nine feet long set into the rocky walls of the canyon. For years this wheel was an interesting feature of the landscape, and remained suspended there long after most of its contemporaries in the line of machinery had rusted into oblivian." Today the property is maintained by the state Department of Natural Resources. Located just south of Baraboo off Hwy 12, this natural falls is the result of eons of water flowing over sandstone rock. Skillet Creek Falls is located on Skillet Creek which meanders its way to Pewit’s Nest, and continuing until it finally joins the Baraboo River. The name is derived from a skillet-shaped rock which exists near the falls. The falls are a steep, stepped drop of around 12 feet, into a shallow pool in a sandstone-walled grotto. The falls are located off South Gasser Rd. on private land. Please respect the privacy of the owner and get permission before entering the property. Created by Native Americans 1,000 years ago, the raised areas are where they planted corn and beans, the grooves were for water. The circular areas between the raised beds were compost pits in the winter and where squash was planted in the summer to keep the ground moist and the critters away from the corn. The beans fed the nitrogen demands of the corn. 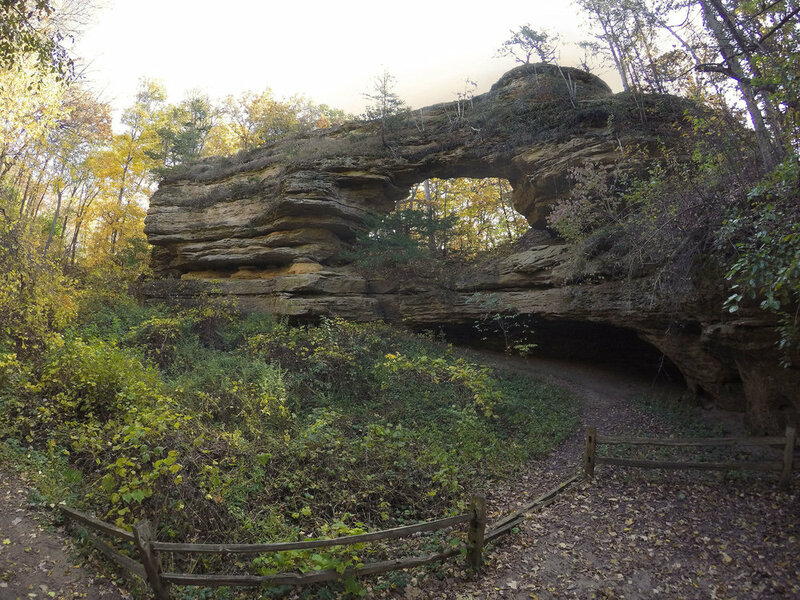 The Natural Bridge State park is located near Leland, on Co. Hwy C. It is at the edge of the Baraboo Range in an unglaciated Driftless Area and located only 12 miles from the edge of where the last glacier melted some 12,000 years ago. Outcrops of sandstone, which were deposited 1.6 million years ago, jut out of tops of nearby hills. The bridge and rock shelter have been weathered out of one of the outcroppings over thousands of years. The top of the arch is 35 feet above ground. The opening is 25 feet wide and 15 feet high. The rock shelter is 60 feet wide and 30 feet deep. An archaeological excavation of the rock shelter was conducted in 1957 by the Wisconsin Historical Society, and discoveries were made indicating that Paleo-Indians inhabited the site 10,000 years ago, making it one of the oldest human occupied sites in northeastern North America. Evidence of fire pits, mollusk species and animal bones were uncovered during the exploration. Since 1870, the natural bridge has been on a list of things to see by tourists. In 1972, a state park was established, encompassing 60 acres surrounding the bridge. Van Hise Rock is located on State Highway 136 near Rock Springs. It is the remnant of a mountain range that may have risen 1000 to 1600 feet above the surrounding terrain. This monolith is the remnant of that mountain chain and stands nearly 14 feet high and 6 feet wide. Its significance lies in the fact that it is composed of two distinct vertical layers, pink quartzite and phyllitic (a red rock similar to slate, having a wavy surface) quartzite. Van Hise Rock was named for the pre-eminent 19th century geologist Charles Richard Van Hise. His understanding of area geology led to an interpretation of the structural Precambrian rocks in Wisconsin. Van Hise Rock serves as a hands-on field laboratory for geology students who are still brought to the site as part of their studies. The Rock was declared a national historic landmark in 1999. Located on Hwy 136, just west of Rock Springs. The gorge was formed when the Baraboo River carved a path through Baraboo quartzite, Cambrian sandstone, and conglomerate. Shear cliffs rise about 200 feet above the river, and extend for three-quarters of a mile. "The site tells a fascinating geological story of changing conditions in an ancient sea that first rose quietly against a cliff of quartzite and then, as layers of sediments gradually decreased the relief between sea floor and land, surged against the top of the cliff, wearing away quartzite and depositing a layer of cobbles and boulders across its upturned edge," notes a Wisconsin Department of Natural Resources description. Thousands of years of weathering and quarrying during the last century, have exposed virgin rock faces in the gorge. Ableman’s Gorge is owned by the DNR and the University of Wisconsin and was designated a State Natural Area in 1969. "Glen" is a Scottish word for a narrow, rocky ravine, and "Parfrey" is after Robert Parfrey (1816-1883), an Englishman who acquired the Glen property in 1865. A series of saw mills, for sawing timber, and grist mills, for grinding grain, was built in or near Parfrey's Glen over a 20-year period, beginning in 1846. Parfrey inherited one of these, a grist mill. The foundations can still be seen just south of the first major stream crossing. The earthen log dam for the millpond was located at the lower end of the gorge, where the trail ascends along the base of the west wall. Water was carried from the impoundment to the mill via a long flume supported on trestles. Parfrey worked at his mill, grinding grain and refinishing mill stones as they wore from grinding on each other, until 1876 when he moved to Minnesota. Milling in the Glen was replaced by hiking and picnicking. People were visiting in sufficient numbers by the late 1800's to prompt an 1882 rumor that a large hotel was to be built at the Glen. Parfrey's Glen thus had a long history of public use before the State began acquiring land at this locality in 1947. Nineteen thousand years ago, a great glacier extended from the north to within 4 miles of the Dells of the Wisconsin River. Then, 15,000 years ago the glacier began to melt, forming Glacial Lake Wisconsin, about the size of the Great Salt Lake in Utah. The 150 foot deep lake was held in place by ice dams which eventually melted, releasing a torrent of water which inundated southern Wisconsin. The meltwaters cut deep, narrow gorges and unusual rock formations into the sandstone and formed the steep-sided canyons and bluffs that are seen today along the Wisconsin River. The gorges in the Dells were likely formed in a matter of days or weeks as the water eroded the soft sandstone. This photo collection includes images of both the Upper Dells and Lower Dells region. White Mound Park is located 15 miles north of Spring Green and 17 miles south of Reedsburg, on Co. Hwy 23. From Hwy 23, turn west onto Hwy GG for 1.5 miles. White Mound Park is Sauk County's largest park at almost 1,100 acres. The 104 acre lake, which lies within the park, was formed in 1970 when Honey Creek was dammed, ostensibly for flood control. Today the park is open for swimming, fishing, boating, picnicking and hiking.